Lee and I have started working on the inside of the house again. The wiring is installed in the second bedroom and I got the sheep wool and rock wool insulation put up. I do love working with the sheep wool as it has a pleasant smell I think. I hauled everything out of Lee’s future office and Lee started installing the OSB for shear. 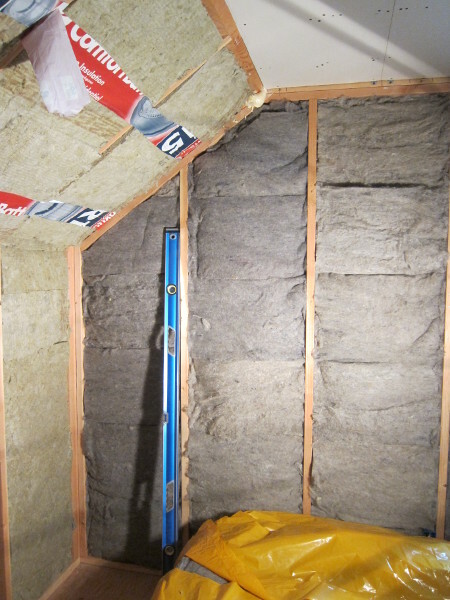 After that we apply 2″ XPS foam for a thermal break, then build the inner framed wall, wire, and then insulate the inner wall. It’s slow going, but we are trying to get back in the groove after a year of inactivity. Sometimes restarting a project is hard but once we do start we get energized. Just out of curiosity, your rock wool is Comfortbatt from Roxul, isn’t it? Totally want to know if it’s made in the US or Canada? They have a new plant in Mississippi. Just to put a spin on our insulation – you’re using R15, we used 2 x R22 to give us R44 LOL!!! As much as I hate insulating, I loved using the Comfortbatt, as well as their Safe’n’Sound which we have inside every interior partition. Beats the pink stuff by a long-shot. But nothing, I mean NOTHING, beats drywall! Yes, this is Roxul ComfortBatt. The package label states “Roxul, Inc. Milton, Ontario”, so I guess we have the Canadian version. I wonder why we get that version, when Mississippi is arguably closer to us. How much different is the Safe’n’Sound from the ComfortBatt? I don’t think we can get the Safe’n’Sound product here. I have been thinking about using it in some wall partitions, but I haven’t done any research on whether rock wool or fiberglass would perform better in this role. Our walls will be R40, but you reached R44 with less complexity. 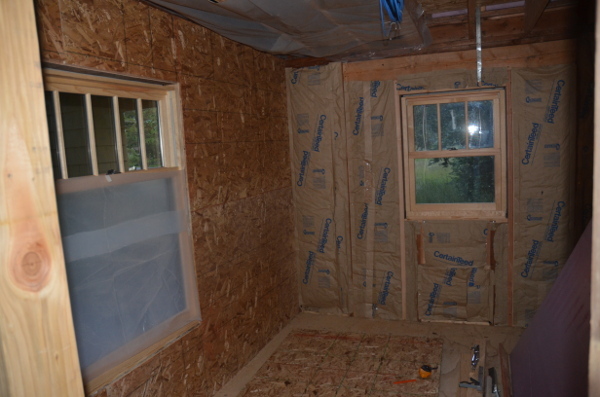 From the outside in, we have a 2×4 wall with R15 fiberglass, then a layer of 1/2″ OSB for shear strength, then a continuous air-sealed layer of 2″ R10 XPS foam which provides a true thermal break (only the floor joists will be a ‘short circuit’), and then an interior 2×4 wall with R15 rock wool. Both products are very similar, Lee. We actually used the ComfortBatt in the interior divisions upstairs, considering we were already using it for the exterior walls. It just seemed easier and more practical. The TDS’s differ from Canada to the US – I wonder if the new Mississippi facility is manufacturing to different specs? It seems that the Safe n’ Sound is available in the US, and I’m also pretty sure if ASTM C423 (Sound Absorption) were run on the ComfortBatt, the results would be pretty similar. We used the Safe n’ Sound on the ceiling that divides our ground level from the second floor. We had some pretty funky wiring to deal with here, and wanted fire resistance more than sound attenuation. After working with both, I don’t want to deal with the pink stuff, ever again! It seems strange that you’d end up with a product made in Ontario instead of Mississippi, but either way, I’m happy you used Roxul. With R40, you’re going to be able to heat with a candle, LOL. Perhaps they try to keep the insulation in similar latitudes to its place of production. The stuff made in Mississippi grew up being told it would keep people cool, so Oregon would be all sorts of confusing for it. We are still fans of the pink stuff because it itches less, but the Roxul is faster to install when the studs are correctly spaced. I love the Passivhaus idea of heating a house entirely from waste appliance heat (and candles), but we can’t achieve that. This house has too many difficult areas to insulate. My realistic goal is that we can warm the house with a couple hour fire in the dead of winter. Ah, you are doing some of the work yourself. Peggy sometimes gets mad because I won’t wait for her to help when I want to get something done, but when I want to get it done, I want to get it done, not plan to get it done, or set a time to get it done, but get it done. Of course, I lack your patience. At the moment, Robin is in charge of insulating and painting. She has told me that wood floor installing will be on the list too. I’m disinclined to argue. I wonder how far she would have to go in the direction of taking on projects before you would become inclined. In most areas, Peggy is highly insistent that I do the bulk of the work, but with her on hand to ask intriguing questions and provide useful suggestions.